Many of you remember when Senator McCain joined with Lisa Murkowski and Susan Collins to thwart a repeal of Obamacare. While McCain is currently involved in an effort to do just this after he got eviscerated in his home state (remember the 40% rate increase last year? ), the President has had to apply himself against a feckless Republican leadership. In the wake of the Democrats Unanimous opposition to the repeal, the bad news accelerated. It turns out that in New Hampshire, their welfare recipients are younger than the national average yet cost 26% more to provide health care for. Despite the loss in Congress, the President has moved forward with gutting Obamacare. They cut 90% of the advertising budget from the department of Health and Human Services. The Trump Administration also cut off a huge slush fund for Obamacare Navigators, actually requiring them to produce results versus taking checks for doing nothing. In 2016, $62.5 million was spent on the program, which resulted in 81,426 individuals signing up for coverage, which was only 0.7 percent of total enrollees. Data finds that there were 17 navigators that only signed up 100 people, which means each enrollee cost about $5,000. There was one Navigator that only signed up one enrollee but received a grant of $200,000. Anthem left Kentucky, leaving most of the state with only one coverage option. This is the sixth state the health insurer has announced it will be either exiting or scaling back coverage in. Anthem has already made these announcements in regards to Indiana, Wisconsin, Missouri, Nevada, and Ohio. Another disaster – 24.8 Million Americans are enrolled in High-Deductible Health Plans. This means most that have insurance now have inferior coverage. Some states have seen deductibles rise at a faster rate than others. For example, average deductibles in Hawaii were only $988 compared with New Hampshire where average deductibles were $2,434. While 14 states saw significant hikes in average deductibles, only two states saw a decline. State officials sounded the alarm Wednesday on Capitol Hill about skyrocketing ObamaCare premiums as insurers across the country propose double-digit rate hikes – renewing pressure on Congress to act. Insurance commissioners and officials from Alaska, Tennessee, Pennsylvania, Oklahoma and Washington state all testified before a Senate committee on the 2018 premium hikes, which are being finalized over the next few weeks. In Alaska, premiums have increased 203 percent since 2013, according to Lori Wing-Heier, the state’s director of the Division of Insurance. “On average, the increase means that an Alaskan in the individual market who was paying a monthly premium of $344 per month in 2013 is paying $1,041 per month in 2017,” Wing-Heier told the Senate Health, Education, Labor & Pensions committee. Got all that? State Insurance commissioners went to Washington DC pleading for help. More than sixty thousand ObamaCare enrollees in Virginia could be without an insurer next year after Optima Health announced it was leaving many of the state’s markets, according to officials in the state. Optima said it plans to exit many of the counties that it served in 2017, after previously planning to cover nearly the entire state next year. The move would leave 63 of Virginia’s 95 counties without an insurance option for 2018…Optima also said it would be raising premiums by 81 percent for any customer who doesn’t qualify for subsidies from the federal government…Optima said some of the premium increase was due to uncertainty surrounding federal funding for ObamaCare’s cost-sharing reduction payments. It also said some of the increase was due to other national carriers leaving the state. Anthem, Aetna and UnitedHealth have already announced plans to exit Virginia’s ObamaCare markets entirely next year. 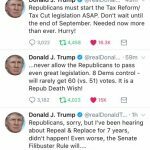 President Trump never stopped hammering Congress even after the first attempt to repeal and replace Obamacare failed. See the embedded tweets that led to a watershed moment in politics that occurred recently as we pick this up in our next post. Mitt Romney was right. Www.parkfamilyinsurance.com – (hint, hint, my day job) was right. IN 17 years of doing insurance, Government interference has been the number one cause of instability. Riverside Sheriff’s Department Update: Honey, I Shrunk Your Database! Plus, Neat Parting Gifts from Jason Huskey!